phoenixfriends has no other items for sale. 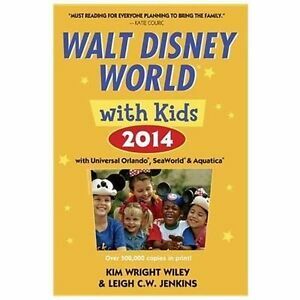 100% of the sale of this item will benefit Friends of the Phoenix Public Library, Inc.
"Kim Wright Wiley has penned 22 editions of this book and really knows her stuff when it comes to planning an Orlando vacation and taking in the attractions at Walt Disney World, Universal Orlando, and SeaWorld. And for this edition she is once again joined by her daughter Leigh Wiley Jenkins. They combine their wit and wisdom with insights from almost 500 families to create a guide that's thoroughly updated, user-friendly, and fun. B>Expanded Coverage: The guide includes new hotels and restaurant menus, as well as complete coverage of the new and improved Fantasyland in the Magic Kingdom theme park. B>Indispensable Trip Planning Tools: Charts and star ratings make comparing hotels and restaurants a breeze. Lists grouping attractions by age group and charts with vital stats on all the amusements make picking must-see sights simple. Checklists allow planning, packing, and devising on-the-ground itineraries to go smoothly. In-the-Know Tips: This book is chock-a-block with time- and money-saving tips and insider's secrets, and every ride or venue has a scare-factor assessment. Mediagenic Author: Kim Wright Wiley is an undisputed authority on Walt Disney Wo One of the few Walt Disney World guides geared towards families with children, this volume is loaded with tips to get the most out of time and money, insiders' secrets, full restaurant and hotel descriptions with ratings, and more. Maps.